Some rooms can make use of a turquoise makeover if you wish to make them stand out. This is a unique color that has its own charm as it’s capable of transforming any area with a calm and serene vibe. Turquoise pairs nicely with other colors including shades of gold and red. It’s a fairly versatile blue shade that you can successfully incorporate in your room décor. The first thing that comes to mind when you think of turquoise might be an exotic beach with crystal-clear ocean waters. Not many colors can be considered so playful and rich as turquoise. 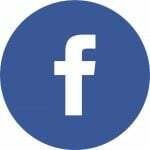 It can be easily integrated into multiple interior design styles as long as the color matches the rest of the elements in the room in a correct manner. That usually means to let turquoise become the prominent color in the room. Turquoise is a statement-making color so you can transform the look of a room and make it feel bolder. 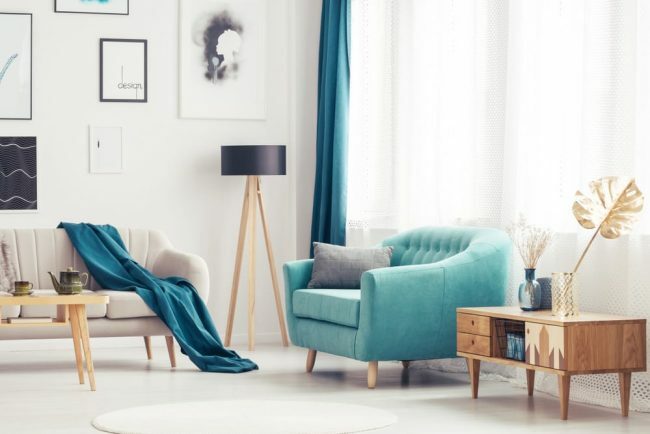 If going for a full turquoise makeover sounds like too much for your tastes, there’s always the option to simply add some subtle and vibrant elements to obtain a more subdued turquoise vibe for your room. Whether you wish to make the room more tranquil or more energetic, take a look at these room décor ideas that integrate this beautiful color. A touch of pale turquoise can have a superb effect in an open-space kitchen. There’s a soothing quality to this hue which can work very well for this environment. As you can see from the picture, this home makes use of a soft turquoise tone to add a feeling of calmness to the dining room and kitchen. The most imposing detail of the room is probably the turquoise patterned wall which seems to add a coastal vibe to the area. Turquoise takes your mind to the brilliant water of an exotic sea and that same effect can be achieved by this kind of sea-grass inspired back wall. The use of white and simple cabinetry offers a pleasant contrast to the turquoise making it fit in instead of looking over-the-top. 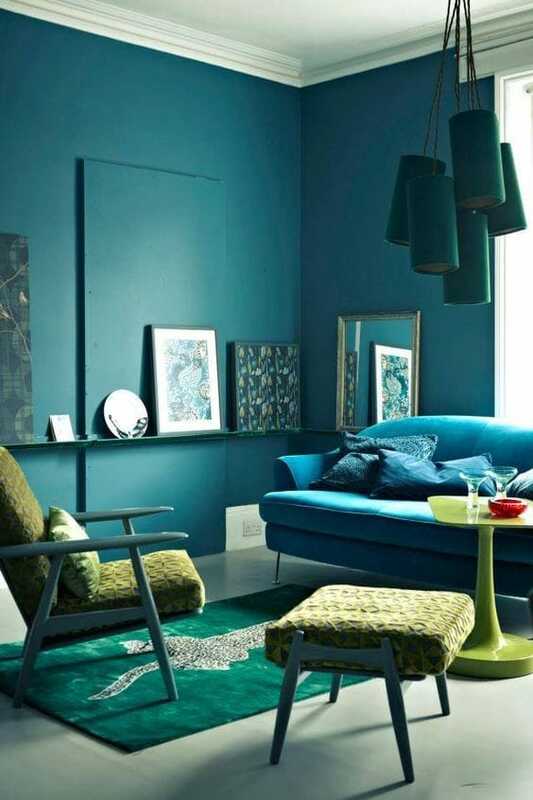 Turquoise could be the perfect choice if you plan on making a statement through a painted wall. Many people prefer this approach when trying to make their living room feel fresher and more colorful. It’s easier and less expensive to paint just a single wall in a bolder shade. The best vibrant choice for a touch of exoticism would be turquoise. Just look at how it provides a stylish background for elegant black and silver accessories. Rooms with a modern vibe can take advantage of a splash of color to make them feel revitalized. A good example is this modern interior that seems to draw inspiration from the Scandinavian décor style. We like the combination of the pastel colors in this living room. 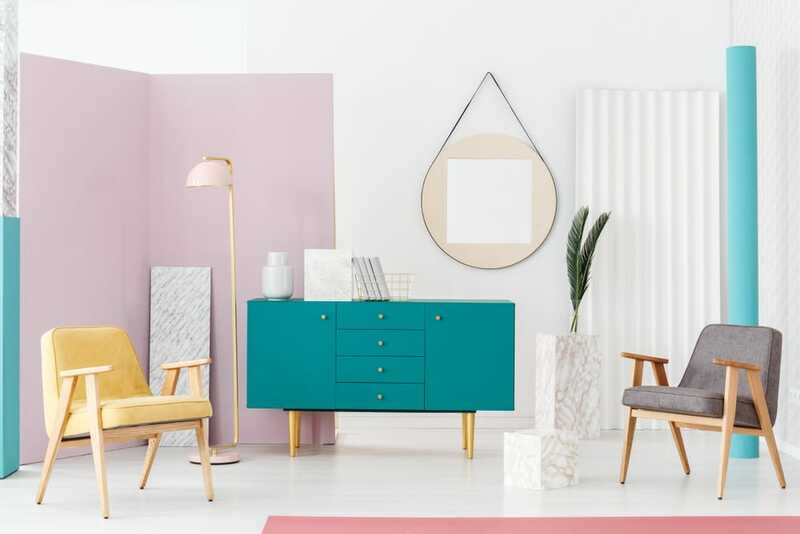 The pink from the wall and rug mixes well with the turquoise of the sideboard creating a sense of playfulness in an otherwise very elegant-looking room. This vibrant shade of blue can find its way in various rooms in your home. 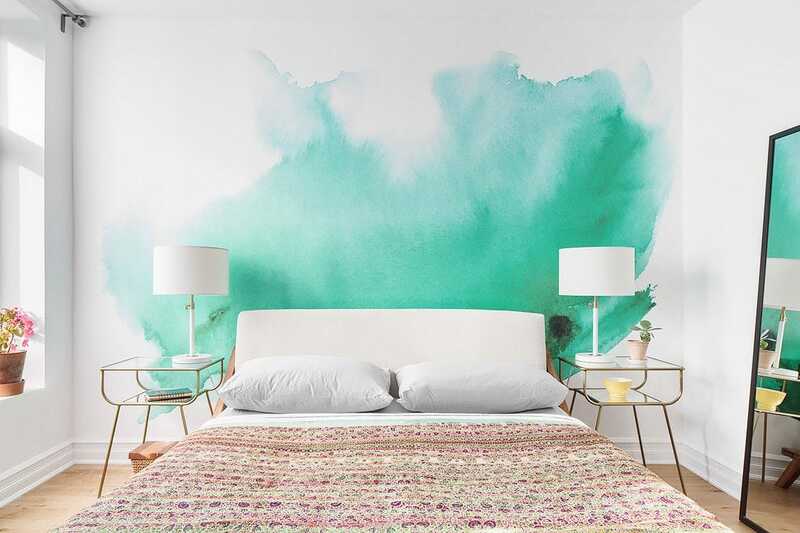 One place that could use some turquoise is the bedroom. Any modern bedroom out there can look cozier with a pop of color that can energize your mornings. In this case, we like the look of the marital bed with turquoise bedspread and pillows. When combined with other monochrome elements such as artworks on the wall or reading lamps, the resulting visual effect is quite eye-catching. If you enjoy a more neutral-toned look for your living room, perhaps turquoise would look better if it’s integrated through accessories. That way you can obtain a more subdued look and the room feels brighter and more stylish with minimal effort. 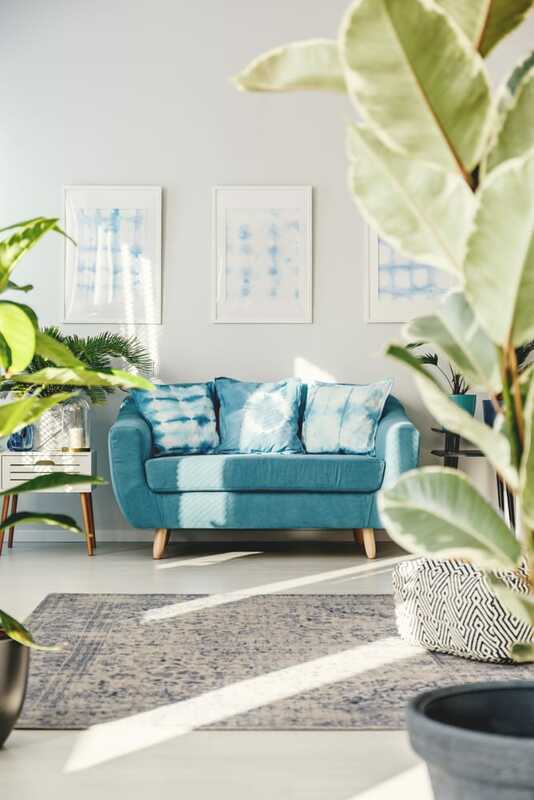 Whether it’s through an artwork piece, throw pillow cover, or blanket, there are multiple methods to try when it comes to adding some turquoise accents. Maybe you’d like a teal floral artwork to decorate the wall such as this one from Amazon. Another solid option for accenting with turquoise is to get a dark turquoise table lamp that can feel at home in any modern environment. One way to make a room feel more luxurious is by incorporating some dramatic flooring choices. This can be done through a turquoise carpet floor if you want the maximum visual effect like you can see in this photo. The large windows and wooden ceiling bring out a very airy vibe with a healthy mix of rustic and modern flairs from the turquoise floor and stone wall. 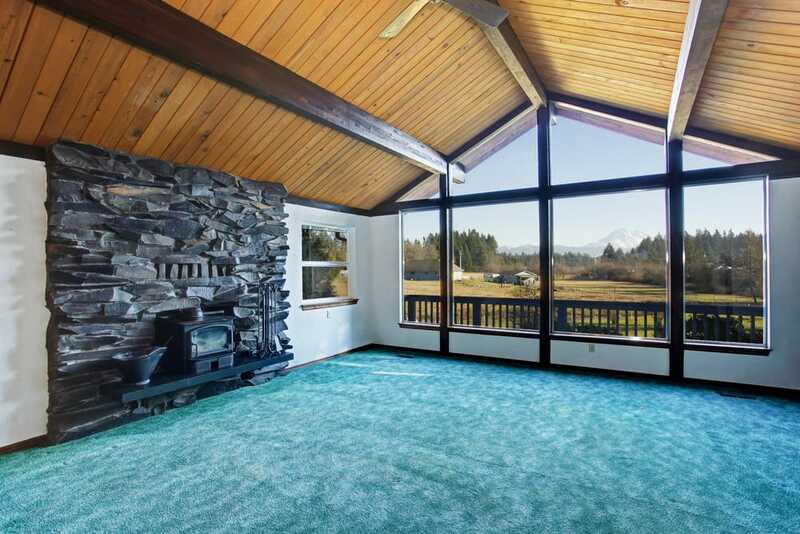 Alternatively, you might consider the integration of a sophisticated turquoise rug. We like this model from Amazon which adds plenty of texture and offers an aesthetically-pleasing geometric design. This is the kind of rug that can complete the look of a turquoise living room as it would be an ideal match for teal furniture. The home office can be designed to stand out compared to the office from your workplace. This is an area that can be embellished with some stylish and colorful elements to give it some personality and make it less boring. Turquoise has the power to make any home office more vibrant and exciting. Whether it’s through a cozy blanket or inspiring artwork, turquoise can be easily implemented even in smaller home offices. 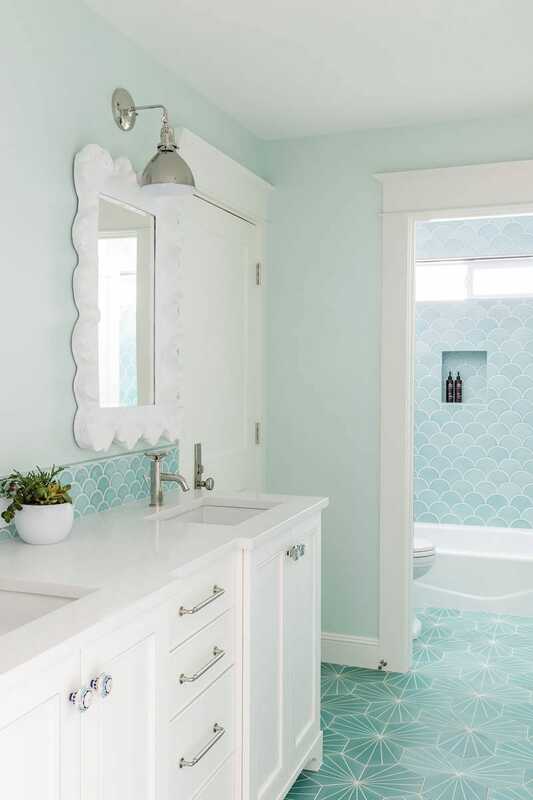 Given the ability of turquoise to take your mind to sparkling ocean water near some exotic islands, it makes sense to include this shade in the bathroom. With the help of turquoise tile trim, you can transform the bathroom atmosphere, making it more than just a functional place in the house. To enhance the coziness of your bathing sessions, you can also add a fireplace in the bathroom. Fans of decorating using the industrial interior design style will probably appreciate the idea of a turquoise brick wall. Even though this vibrant shade won’t usually play a role in industrial décor, it can make an interesting statement for those with more eclectic tastes. 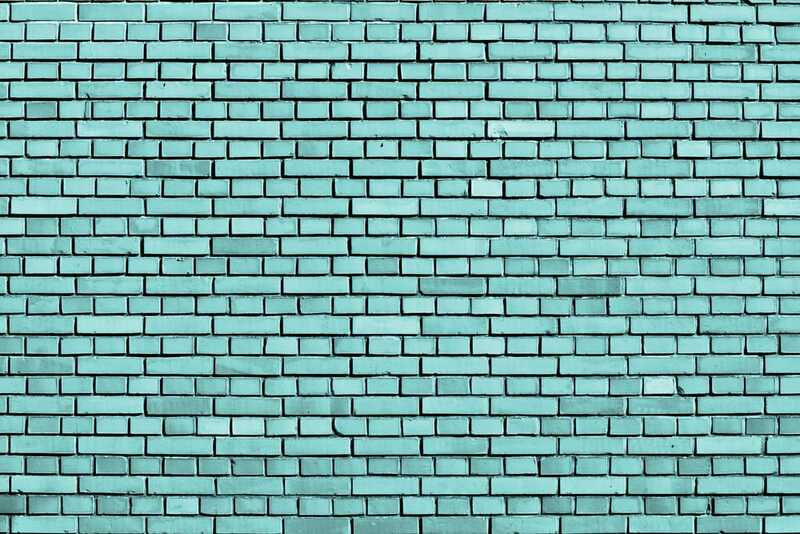 A brick wall painted in turquoise is definitely the kind of unexpected element that some people prefer to add to their home. Turquoise has great decorating potential as it can easily remind you of sparkling gemstones. One way to include it successfully in your study is by choosing darker hues. A teal desk looks rich and sophisticated against dark turquoise windows and ceiling. To complete the exotic look, you can add an oriental rug and velvet green chairs. Turquoise in this study seems to have a strong effect, and that’s mainly due to the combined painting of both the windows and ceiling using the same shade. 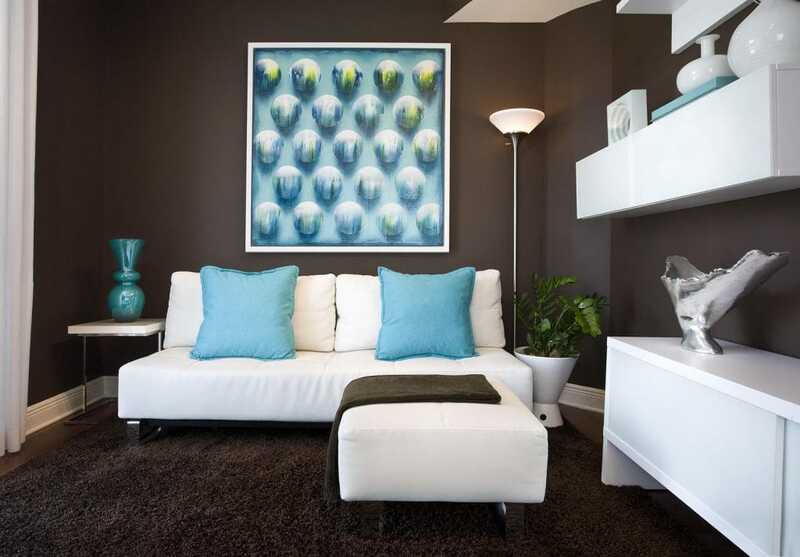 The room feels surprisingly inviting thanks to this enveloping effect created by turquoise. The children’s room can always benefit from the addition of colorful elements. Turquoise works well to decorate this room. 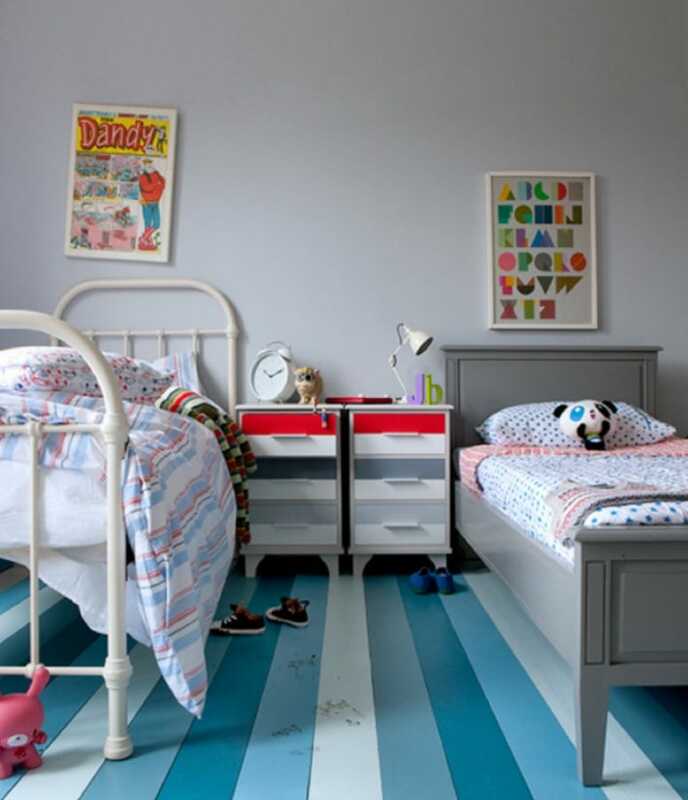 We like this example as it makes use of different blue shades and white to create a striped pattern on the floor. It provides a playful background where you can bring in some more colorful patterns like polka dot pillows on the bed or artworks that make use of geometric designs. Turquoise patterns might seem too strong for other rooms, but the kids’ room looks stunning in this way. One area that can take advantage of a healthy dose of color is the hallway. This is an often neglected room where making a good first impression counts. That’s why you should consider a turquoise makeover for a brilliant look that will be unforgettable for your guests. The hallway in this picture takes things a little to the extreme by painting both the walls and ceiling the home. If that seems excessive to you, there’s also the quick solution of adding more decorative turquoise pieces. Take a look at these turquoise pillar candles. Another great example to try is adding a set of decorative glass vases. The brilliant shade of turquoise will add some richness and sophistication to any place. If you like the idea of a traditional room, there’s still a way to include turquoise in a harmonious manner. The key is to use it as a background effectively while mixing in plenty of white elements. A bedroom can use turquoise walls to show off some traditional-style furniture pieces that contrast nicely thanks to their earthy light brown shades. There are lots of great examples where turquoise creates a pleasant visual effect. The dining room can look a bit odd if you concentrate the turquoise accents in a single spot. 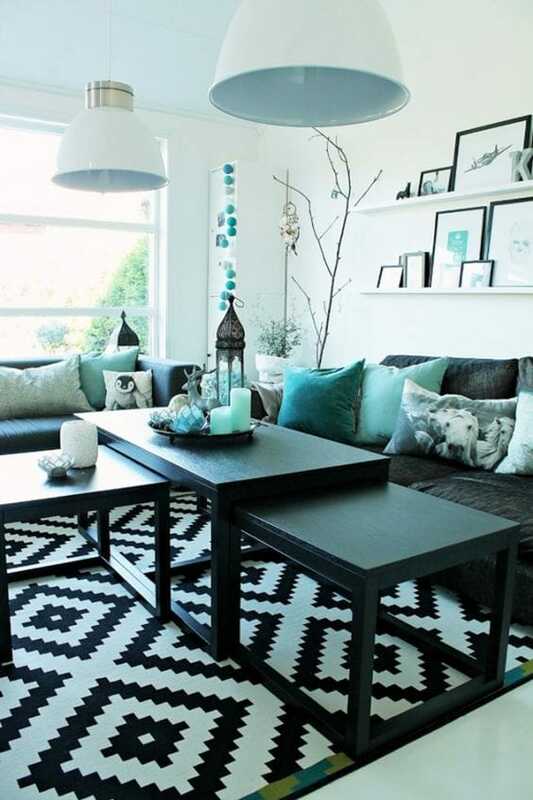 For this reason, it’s recommended to spread out various splashes of turquoise and create a more cohesive look. The room will seem more balanced and turquoise will seem less overpowering if you add plenty of neutral tones such as cream and white. The bathroom is a great match for integrating turquoise. This color has a certain wow factor that makes any area feel modern and cool. Some subdued shades of turquoise used for the tile in this room blend very elegantly with the white furniture accented with silvery finishes. The tile work feels so dreamy thanks to the stylish patterns used. 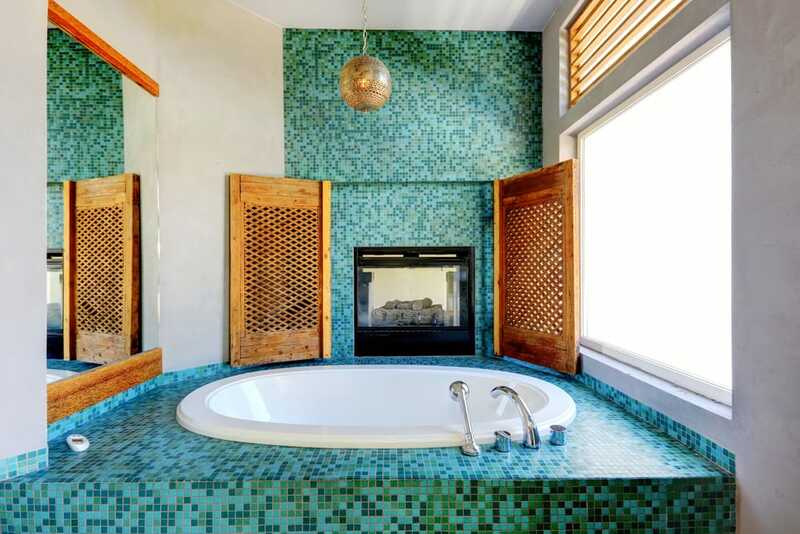 If you like the idea of making the bathroom a relaxing oasis, turquoise needs to be added one way or another. Don’t forget to paint the walls in a matching tone. One amazing color combination in the world of interior design is turquoise with lime green. There’s just something about this refreshing shade of green that makes it suitable for being paired with turquoise. Combining different shades of dark blue such as teal can provide excellent accents against the dominant turquoise of the walls. This is an excellent color combination for obtaining a casual sophistication effect with some extra coolness thrown in. When styling the bedroom of a teenage girl you can easily integrate turquoise among white and red elements. While red tones provide a bit of boldness and capture the initial attention, turquoise is used through various accents to keep the atmosphere fresh. The color scheme in this bedroom creates a uniform look as it stays within some well-defined limits. The turquoise bedspread matches the painted ceiling while the light purple rug is the best match for the same-colored walls. Here’s a flamboyant combination that can brighten up any bedroom. The wall is painted with a flashy turquoise in an artistic manner while keeping the prominent color scheme white. Thanks to the gold accents on the nightstands and lamps, the room feels a bit more glamorous and warmer. The symmetry also helps to tone down the impact of the colorful wall. Turquoise is incredibly versatile and you can adapt it to enhance the feeling of airiness in a room. This mint green bedroom looks stylish and playful thanks to the beautiful patterns used. The sheer white drapes add some natural light that keeps the atmosphere relaxed. All the elements and accessories contribute to create the overall impression of comfort and to give the area a unique personal touch. 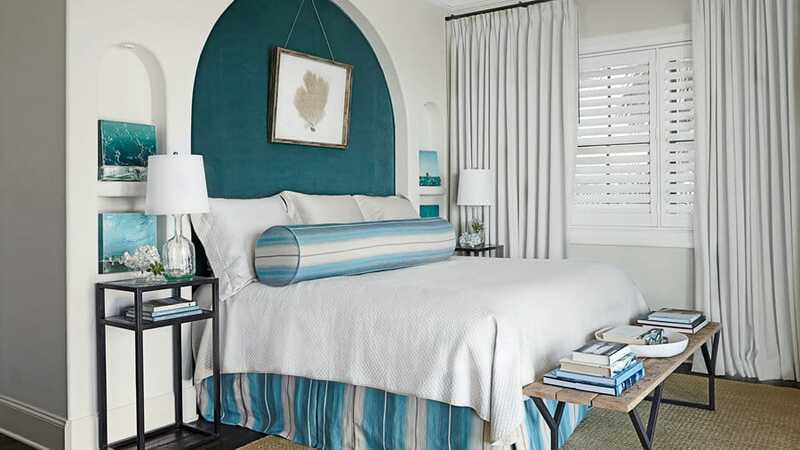 Turquoise and white is an outstanding combination for the bedroom if you prefer a chic look. There’s no doubt that different patterns are hard to pull off in this kind of room. Thanks to the cooling effect of this pale shade of turquoise, the room becomes easily beautiful. While so many patterns concentrated in one place can seem odd or inconsistent, this room manages to capture the attention through so many vibrant points of interest. Those who like the idea of bringing a feeling of serenity in their bedroom shouldn’t miss out on the potential of turquoise to brighten up a room. A turquoise wall with a particularly large window represents a great combination. For a modern Zen vibe, we recommend introducing some black and white graphic elements. This helps to make the turquoise stand out and refresh the entire aspect of the room. If you’re into making a truly bold statement, one of the best solutions is to add an unexpected flavor while decorating with a specific interior design style. 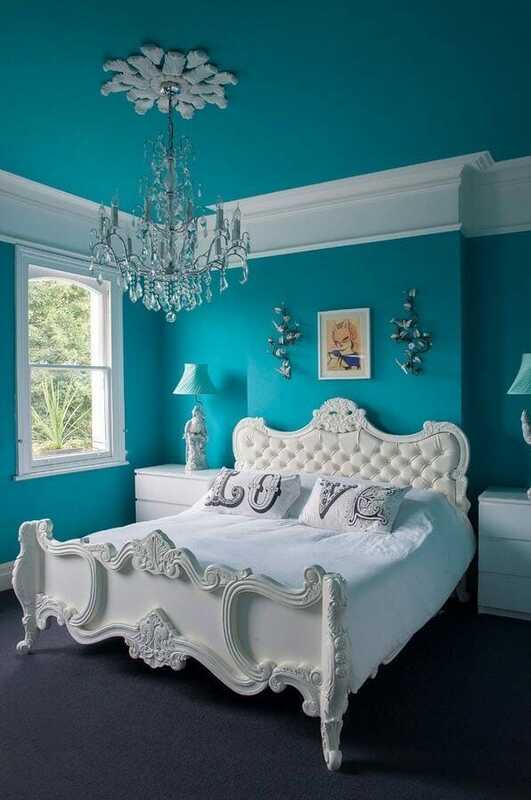 In this example, we have Victorian Gothic elements such as the ornate bed and the luxurious chandelier combined with bright turquoise walls and ceiling. The white tones are quite unexpected when used with this style, but the turquoise takes it a step further by creating a uniquely memorable look. 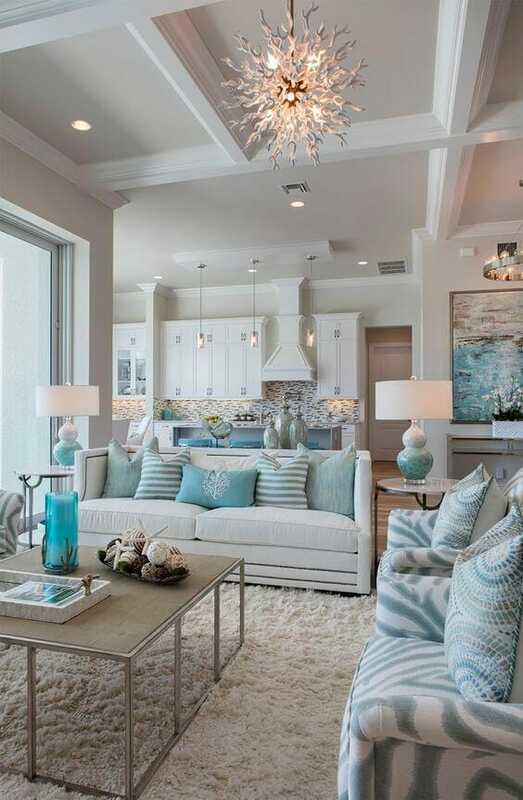 The power of turquoise to create a coastal vibe can be enhanced by the addition of beige elements. The sand-colored rug offers textures that take your mind to the beach while the various turquoise details complete the coastal theme. Plenty of different types of lighting fixtures contribute to the charming atmosphere. Turquoise looks brilliant by itself, but you can use it in a smarter way if you plan to decorate a room with it. One interesting idea involves enhancing the soft neutral-toned elements of a living room. 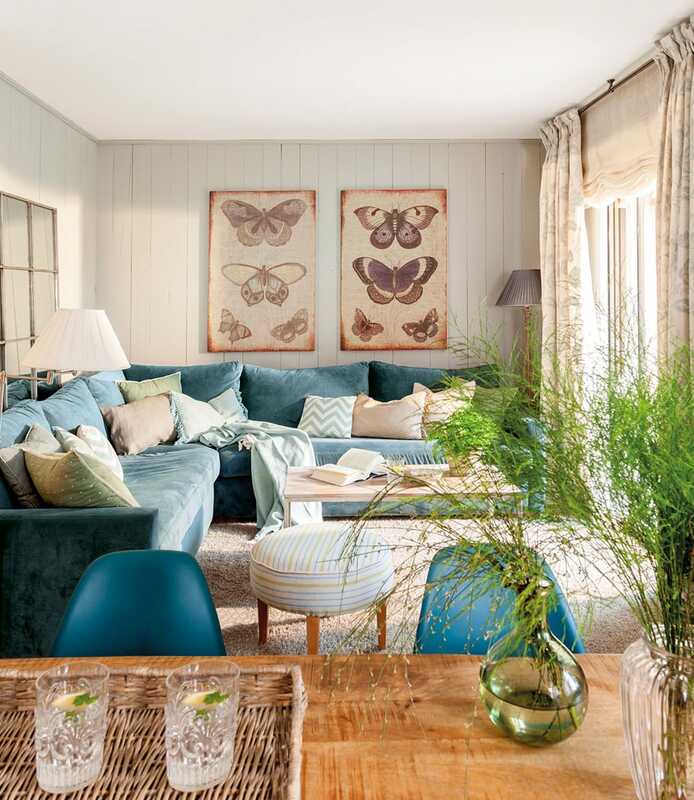 When the general color scheme makes use of mostly beige, tan, and wooden hues, turquoise can be integrated and enhance the overall energy of the room. A sectional sofa colored in deep turquoise and a couple of simple chairs – these are enough elements to keep the atmosphere mellow and subdued. There’s just enough turquoise added on top of the neutral surroundings to maintain a sense of coziness and flow to the entire space. 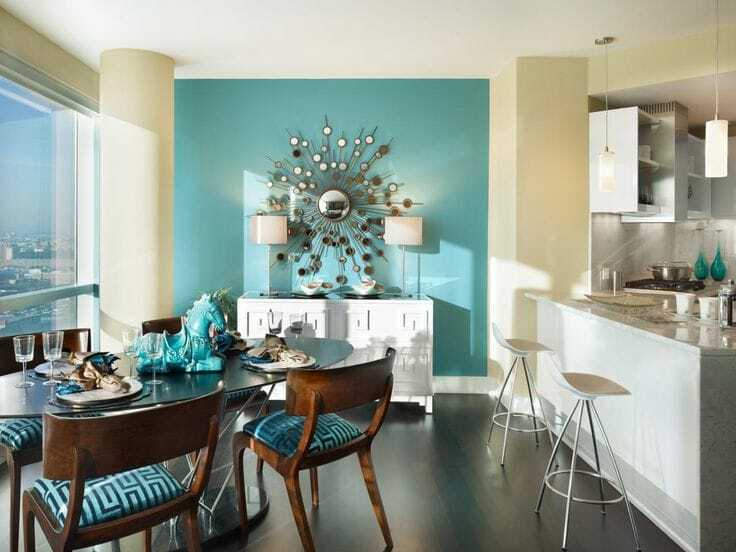 The color turquoise has the ability to create a stunning impression when it comes to elegant rooms. This vibrant shade mixes well with darker tones like grays and blacks contributing to the overall look with its own elegant touch. A pale turquoise frame is used for the mirror here and the choice seems inspired considering the crystal elements throughout the room. The rich style of crystal décor takes advantage of the gemstone-like quality of turquoise. While most people prefer turquoise accents when decorating their kitchen, others wish to take a bolder approach. 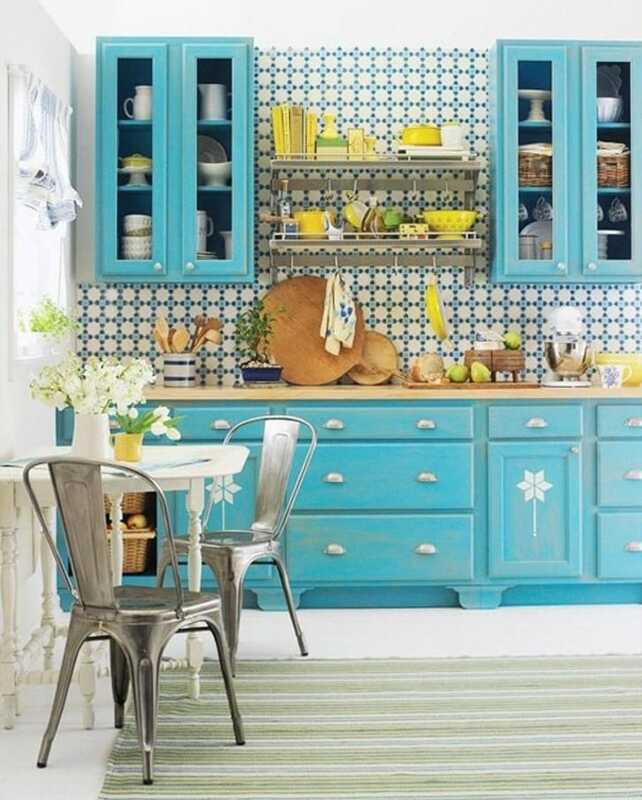 If that sounds like something you’d like to do, check out this stylish kitchen featuring turquoise furniture. To keep the coolness effect toned down, the designer used plenty of yellow and green accessories. Natural wood also contributes to keeping a balanced appearance. Sometimes a few well-placed turquoise accessories create a more striking visual effect compared to a more intense makeover. Turquoise is usually added to boost the vibrant energy in the room, but that’s definitely not a rule set in stone. We like a simple look that’s decorated with just a few details like a turquoise vase or two colorful pillows. Keep a strict color palette and use turquoise just as a subtle touch to provide a pop of color. We’ve already seen the great potential of turquoise to bring some coastal vibes in the room. If you wish to take it to the next level, consider a bolder makeover and create a fully beach-themed bedroom. Don’t just limit yourself to turquoise walls, but include the color through as many elements as possible such as drapes or rugs. Here’s a set of curtains from Amazon that will enrich any bedroom with some turquoise style. For a more romantic atmosphere, you can also add some artworks or even paint the wall with palm tree motifs. Aside from some greenery and white furniture, one element that shouldn’t miss is the ceiling fan. The final result could be an authentic-looking beach style room. A pale shade of turquoise on the walls brings a nice softness to this small bedroom. Furnishings are kept to a minimum which boosts the airiness of the room. The bed offers an imposing impression with the help of its dark turquoise headboard. This is a feminine look considering the delicate accessories used and the balanced blend of white and light turquoise. Chocolate brown shades work surprisingly well with vibrant splashes of turquoise. 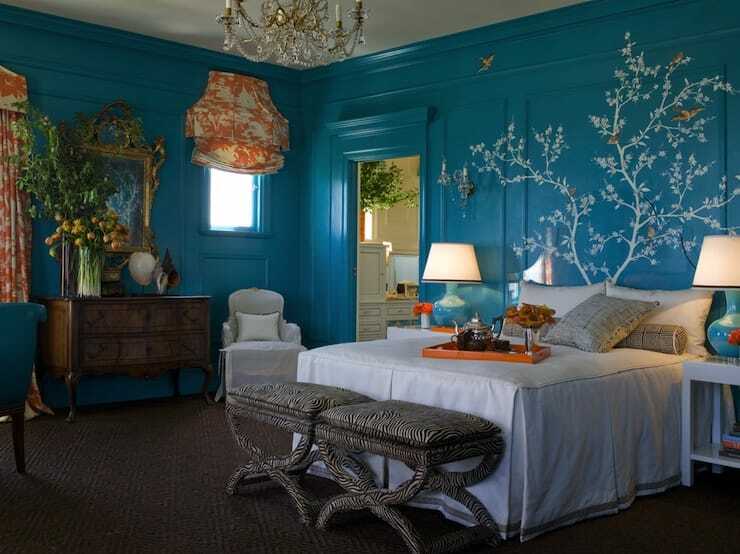 This bedroom features two walls painted in different shades and that makes for a very eye-catching contrast. The marriage of these two colors is complete through the addition of matching pillows, comforter patterns and other elements such as the hanging flowers and wall decorations. Black elements are usually associated with elegance. If you don’t add some colorful pieces you might end up with a gloomy look when relying on too much black décor. This is where turquoise can come in and add a cheerful vibe to the modern black room. With some colorful turquoise accents and decorations, any dark living room will look amazing. Despite the cool sensation that turquoise inspires in most places, this black room seems somehow warmer with it. Check out this soft fur throw pillow case from Amazon which also brings some much-needed texture in the mix. 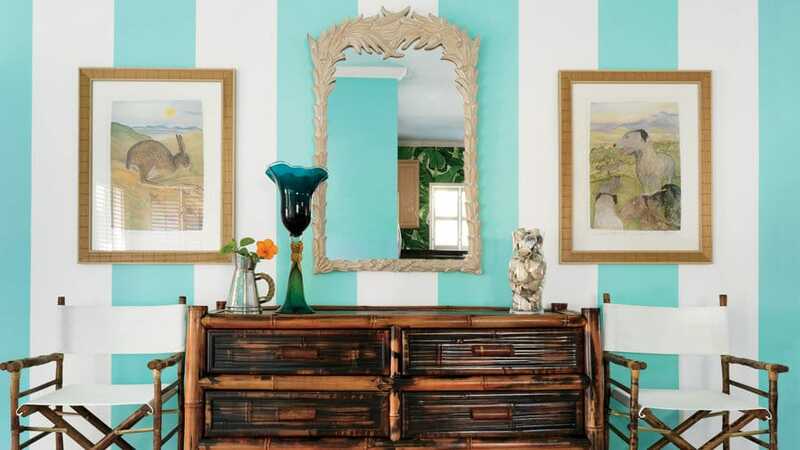 An innovative way to integrate some flashy turquoise into the room’s décor is by using pretty stripes. The wall in this room is painted with a playful mix of pale turquoise and white offering a spectacular background for the antique elements such as the buffet. The symmetry of artworks and directors chairs creates an exquisite look that shouldn’t miss from a vacation home. Blue is a popular option when it comes to selecting the color palette of a little boy’s baby room. Embellishing the child nursery with a striking shade of turquoise represents a timeless solution for a traditional-looking baby room. The neutral-toned furniture has some turquoise details and you can spot a beautiful contrast of the blue rug with the floor which contributes to the cohesiveness of the entire room. Those who are into retro décor are well aware of the important role of turquoise in the color palette of this interior design style. Together with cherry red and mustard yellow, turquoise offers some strong retro vibes when it’s used with the right decorations. 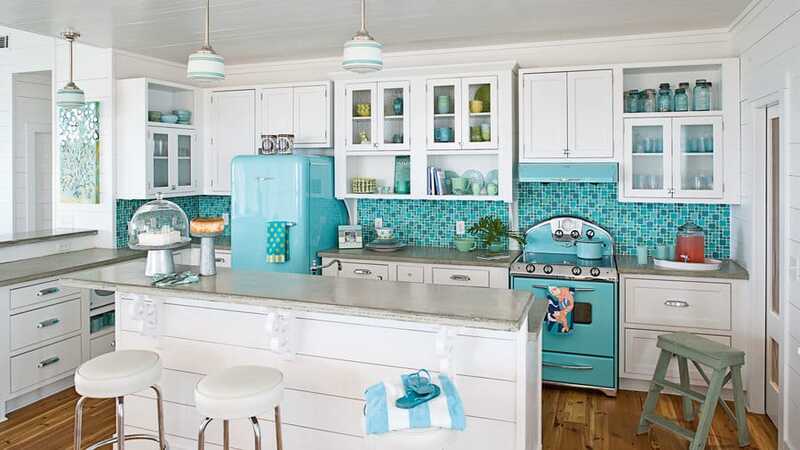 Choosing turquoise kitchen appliances that also conform to the design rules of the retro style (such as rounded corners and chrome accents) is highly recommended if you wish to transform this room in a more cheerful and memorable space. Decorating the bedroom with a splash of turquoise can be simplified if you have an alcove. 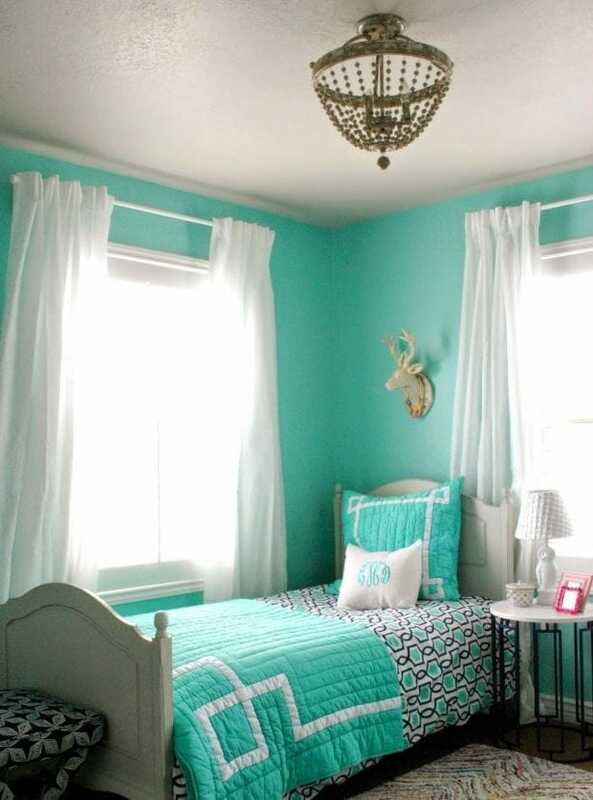 You can make it more colorful and match the teal shade with some bright turquoise accessories throughout the room. The skirt of the bed looks quite playful thanks to the patterned white and turquoise design. Other notable accessories in the room such as the little artworks in the smaller alcoves contribute to the general eye-catching impression as well. Turquoise-colored accessories in the room can pop out in a more striking fashion if you choose the right color for the walls. We like the idea of painting the walls with a cheerful shade of yellow as it provides an excellent background to allow the turquoise details to shine. This is truly a unique combination that might be difficult to pull off. The way the geometric patterns found on the bed match the curtains represents a nice touch. When used correctly, turquoise and yellow can find a harmonious balance. Turquoise gives off some exotic vibes which are welcomed for rooms decorated in the Moroccan style. 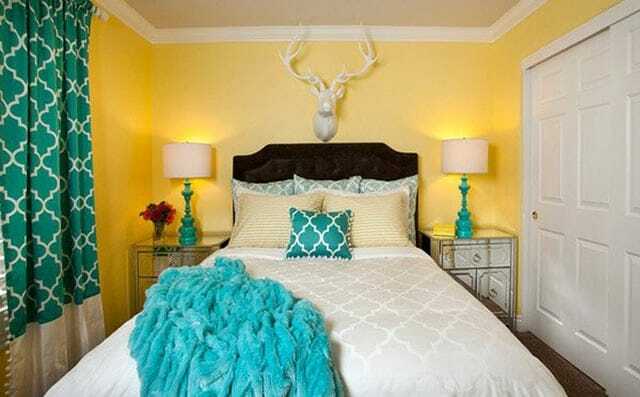 The gold geometric patterns of this bedroom seem to come alive when placed against a turquoise wall. It’s worth mentioning how elegant this bedroom looks thanks to the symmetry of the elements such as nightstands, curtains, and lamps. To keep the gold and turquoise combination from being too overpowering, there are enough white elements present such as the immaculate carpeting that’s brimming with texture. Gold details throughout complete the luxurious look of this Moroccan style bedroom. 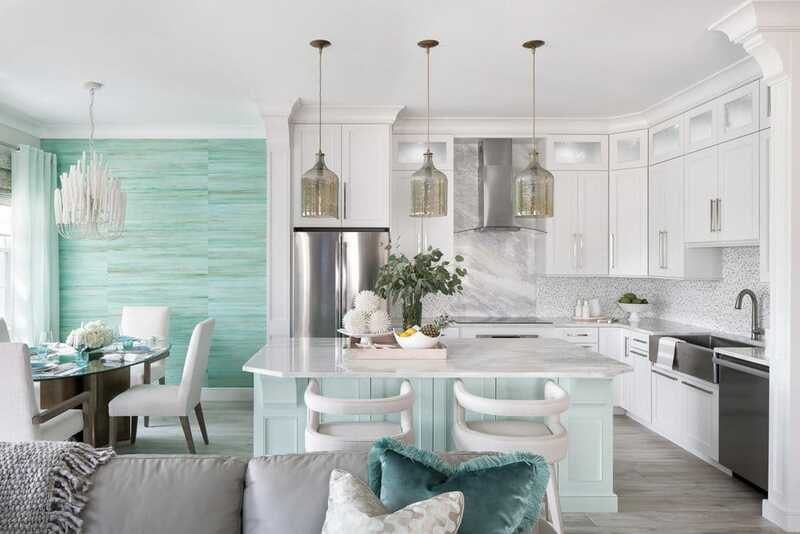 While turquoise seems to blend well with many design styles, those who favor the rustic look tend to avoid it for being too bold for their tastes. 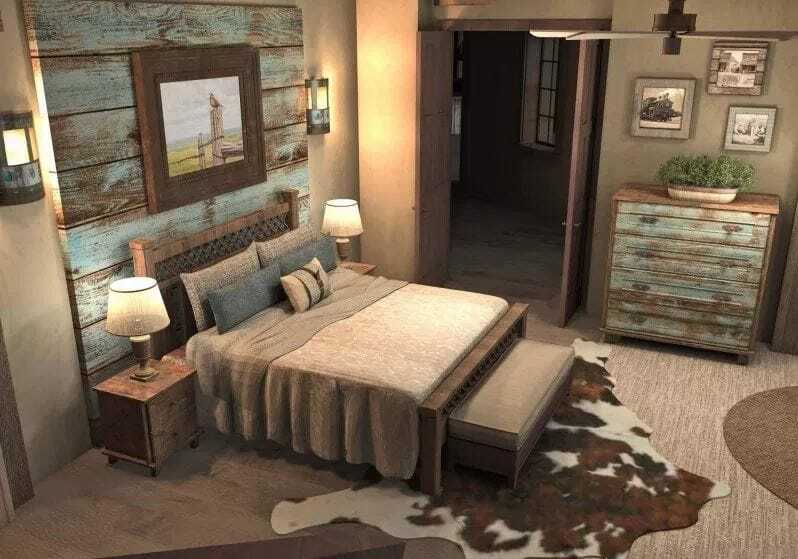 Even so, the rustic turquoise look is a thing and you can manage to design your room like this if you just pay attention to some important details. As turquoise is a dramatic color, it’s a good idea to tame its liveliness a bit by mixing it with more earthy shades of wood. This room is an excellent example as it showcases how turquoise gets integrated alongside rustic décor through painted wooden boards. 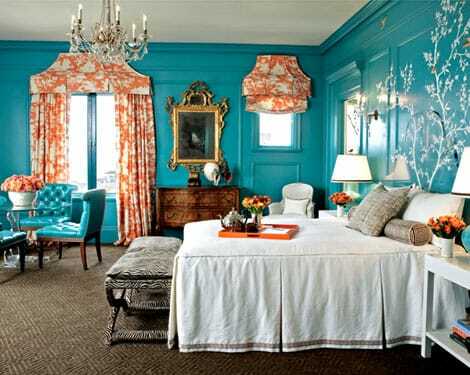 If you wish to create a regal look in the bedroom, turquoise could be a fitting choice. When added through lots of matching elements, the imposing effect of this shade is more extravagant. Turquoise represents a great complement for some gold and silver trim works. A nice feature here is the painted ceiling which seems to reflect the stylish atmosphere of the room thanks to the addition of elegant gold moldings. The turquoise bed has a canopy that contributes to that regal vibe. There are few color combinations that have such a vivid impact as turquoise and orange. These are both vibrant shades that seem to complement each other very well. The elegant turquoise wall in this room is decorated with captivating moldings, but the real highlight comes from the orange curtains. This is a combination that inspires happiness and you can incorporate it in multiple design styles. Details like the vase of orange flowers or the tray placed on the bed complete the overall look and bring to life the antique pieces in the room. Rooms painted in a nostalgic shade of pink can easily appear too immature. Adding some strong turquoise vibes represents the best solution to counter that effect. The result is a stunning look given how the bright turquoise found on the bed, curtains, and rug blend with the matte pink finish of the walls. Adding large curtains in this room seems like an inspired choice as they enhance the atmosphere with the jewel-like hue of turquoise. This bedroom manages to blend some strong vintage vibes with exotic and sophisticated elements for an impressively unique look. The way the room is sparsely furnished helps to improve the sense of space making the area brighter and more inviting. If you’re wondering about creative ways to incorporate turquoise in the room, check out this stylish zebra pattern. This is one idea that’s sure to improve the look of any room, particularly the bedroom. The pattern seems dazzling to the eyes, and the intense turquoise accessories mix well together resulting in a harmonious design. Adding plenty of bright white color cancels out the boldness of turquoise to prevent it from creating an excessively flashy look. 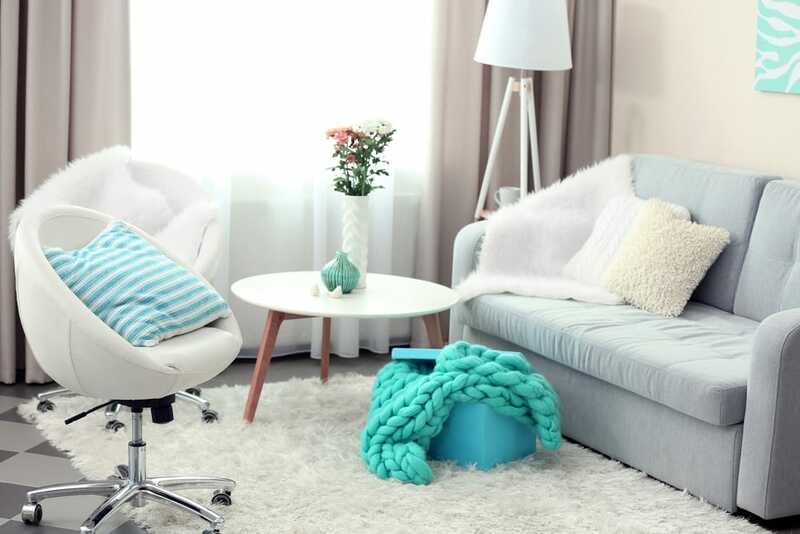 Rooms decorated with turquoise accessories look beautiful, but if you want to make a statement, your only choice is to use turquoise-colored furniture pieces. We’ve seen how stylish sofas, cabinets, and other furniture pieces can look with a turquoise makeover. This custom-designed turquoise bunk bed follows the same idea. The chosen hue isn’t too vibrant for a more calming effect on the eyes.